Converting acoustic power from thermoacoustic engines into electricity using resonant linear alternators is a common approach but has severe limitations in terms of cost and scalability. The increase of moving mass with increasing power finally sets a practical limit caused by the extreme periodic forces in the construction and impossibility to maintain clearance seals stable over a large stroke. An option, in particular for low cost generators for rural areas (e.g. FACT, Score) and for high power industrial applications( e.g TAP), is to convert the acoustic wave motion into rotation first. This allows for deploying standard generators. Rotational speed could be made arbitrary high. Therefore this type of alternators require much less magnetic material which significantly reduce size, weight and cost. Linear alternators with pistons or membranes make use of the pressure variation of the acoustic wave. There is however no physical reason why not using the periodic velocity component of the acoustic wave. A way to convert such a bi-directional flow into rotation is known from shore and off-shore electricity production plants based on an oscillating water column (OWC). In this type of power stations, waves force a water column in a chamber to go up and down. This chamber is connected to the open atmosphere and the periodic in- and outflow of air drives a bi-directional turbine of which the rotation direction is independent of the flow direction. This class of “rectifying turbines” is explored extensively and in principle they can be deployed for conversion of periodic acoustic wave motion as well. Common to uni-directional turbines they could lift or impulse based. For this application the impulse version seems to be most appropriate because of they are self-starting and could operate over a large amplitude range. For testing and validating this option both an radial and axial bi-directional turbine designed and build using 3-D rapid prototyping. 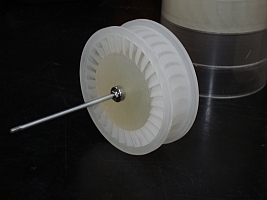 Below the 3D design and the “3D printed” result for the radial turbine. The radial turbine could be positioned at the junction between at the end of a feedback tube and the volume in front of the cold heat exchanger (e.g. TAP). For such small turbines (80 mmØ) a rotor efficiency of 40% is according to theory. The same rotor scaled up to 300 mmØ will have an efficiency of 70%. Because of the periodic flow is at a fixed frequency, acoustic manipulation of the flow around the in- and outer vanes could raise the efficiency over 80%. This is for further study. 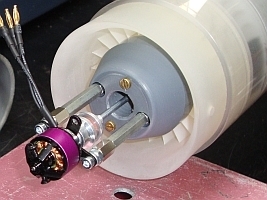 In order to validate the concept, a full scale radial bi-directional impulse turbine is under construction now for testing in the TAP (see previous posts) replacing the current linear alternators. Thermoacoustic electricity generation is still under development. The emphasis hereto is on increasing power level and efficiency and in reducing the cost per Watt electric output power. Early May, Aster together with the Nottingham Score team managed to get the demo2.2 Score thermoacoustic engine to produce 36 Watts electricity continuously, and 45 Watts peak. The working gas was air at an absolute pressure of nearly 200 kPa. A high power speaker was used as alternator. Its acoustic to electricity conversion efficiency is about 50% which means that the engine delivers 70-90 Watt net acoustic output power. Increasing the mean pressure up to 250 kPa and/or using a more efficient alternator will suffice to achieve the 50 Watt project target. This result was obtained by modifying the acoustic circuitry toward a serial connection of two individual (acoustic) matched engine stages. This yield both a higher power density and a reduction of feedback tube length. The test set-up is shown below. The current (messy) shape of the tubing is for measuring purposes and for easy access. In a final version the tubing can be folded to fit into, or be part of, the wall of the stove. Note the relatively short feedback tube length which allows for a higher frequency and proportionally higher electric output of the alternator. Pilot Thermo Acoustic Power (TAP) completed! On March 7 the project team presented the results and a full functional pilot of the TAP (Thermo Acoustic Power) to the public. The TAP is build and installed at the premises of Smurfit Kappa Solid Board located in the north of the Netherlands. For a selected group of about 25 representatives from industry, economic affairs (SBIR) and press, the operation of the TAP generating electricity from the waste heat in the flue gas of the STEG was successfully demonstrated. 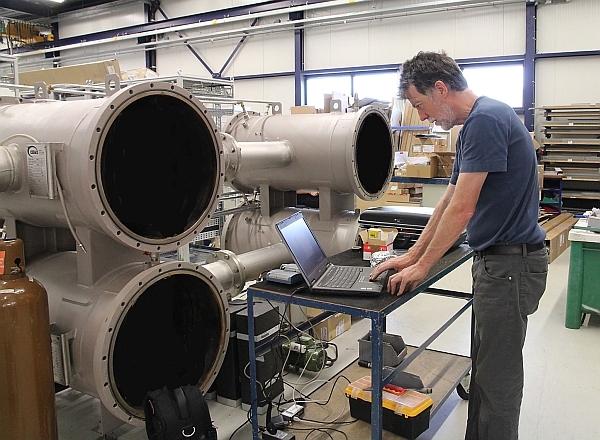 The aim of this pilot was to prove the scalability of thermoacoustics from lab to industrial temperature and power levels, and to prove the economic feasibility of the TAP. The first goal, the scalability of the thermoacoustic process, converting heat into acoustic (= mechanic) power, up to industrial levels was proven successful, showing an exegetic efficiency of 38% (see previous post). The economic target however is still behind, consequently delaying the intended market introduction for this year. For the conversion of acoustic power (generated from the waste heat) into electricity, linear alternators were deployed. The costs of these alternators was, and is still, found too high. Current cost of the alternators only, already exceeds the target cost of the complete TAP installed (3000 € / kWe ). Development of a scalable and cost effective alternative for the conversion of acoustic power into electricity for the TAP. Beside improvements on the linear alternators, a serious cost reduction could be obtained by converting the acoustic output power into mechanical rotation allowing for the use of standard generators. Recent experiments with a small scale bi-directional impulse turbine were encouraging. A full scale turbine with generator is under construction for testing in the current pilot set-up. Utilizing the concept as a heat transformer, eliminating the need for alternators or other mechanical moving parts completely. A heat transformer is a (multi-stage) themoacoustic engine acoustically coupled with a thermoacoustic heat pump by sharing the same traveling wave acoustic resonance or feedback circuit. For use as a heat transformer, the waste heat from an industrial process is split in two flows. One flow is supplied to the engine stages. The other flow is supplied to the heat pump to raise its temperature above the pinch. In other words, a part of the useless waste heat of a too low temperature is converted into heat with a higher temperature so it can be reused in the industrial process. This way, primary energy is saved and CO2 emission reduced. Advantages of a thermoacoustic heat transformer over existing heat pumps are the lack of exotic cooling refrigerants, the flexibility and the extreme large operating temperature range. For example, the output of the same device could be cold as well by simply commute the heat pump high and low temperature heat exchangers connections. Reacties staat uit voor Pilot Thermo Acoustic Power (TAP) completed! At an input temperature of 99°C and heat rejection at 20°C this corresponds with 38% efficiency relative to the Carnotfactor. This is an encouraging result because it proves that the thermoacoustic process can be scaled from lab size up to power levels in real applications. For this measurement the TAP did not run at the proposed configuration of a 4-stage engine driving four loads (alternators). This is because on the moment no correct linear alternators are available. Therefore, to be able to judge the performance of the thermoacoustic part of the TAP, one of the four engine stages is used as an artificial acoustic load. This is done by disconnecting the high temperature hex of this stage from the heat source. Net acoustic output power of the remaining three engine stages in that case is the difference between the acoustic power at the in- and output of the disconnected stage. The measured values for a 3-stage engine at these low power levels (relative to the design values) are found to agree well with the simulations. The 1.64 kW output power is reached with helium at a mean pressure of 750 kPa and at only 1.7% drive ratio. At this pressure amplitude the acoustic power in the feedback loop is nearly 6 kW. Simulation for the initial 4-stage engine running at a drive ratio of 5% shows that for an input temperature of 140 °C the acoustic output power will be about 11 kW. An important parameter to judge the performance of an thermoacoustic engine is the relation between applied temperature difference and acoustic power in the feedback loop. The “steepness” of the curve versus the temperature difference across the regenerator is a measure for the internal viscous losses in the acoustic feedback or resonance circuit, the heat exchangers and regenerator. Plotting acoustic power versus the input temperature difference also includes the effect of temperature drop across the high and low temperature heat exchangers. For the 4-stage engine the measured data for both air and helium as working medium is plotted below. The plot shows that the onset temperature depends on the mean pressure and that for helium at 750 kPa oscillation start at 40°C temperature difference. For air the onset temperature is even below 30°C but the less steep curve indicate higher viscous losses with respect to the acoustic loop power (which for air at the same pressure amplitude is lower than for helium due to the higher value of ρ.c). Note that these figure holds for the current implementation only and that, for example, inserting alternators or changing heat exchangers or regenerator material or structure will modify this figure. In the current TAP the first energy conversion step, from heat into acoustic power, is demonstrated to be feasible at relevant thermal input powers according to the project plan. The second energy conversion step, of acoustic power into electricity, however fails to convert the acoustic output power available into the planned 10 kW level electric output power. For the travelling wave multi-stage configuration the acoustic impedance at the pistons of the linear alternators needs to be real in order to extract maximum power at minimum pressure amplitude. A real acoustic impedance means that the mechanical resonance of the alternators should be close to the acoustic oscillation frequency set by the feedback loop length. Initially the TAP was designed for running at 70-80 Hz. In the end however, the high moving mass (magnet + springs) limits the mechanical resonance frequency of linear the alternators to no more than 40 Hz. This mismatch dramatically reduce the load to the engine and from that the amount of acoustic power that could be extracted. This issue and some other necessary re-engineering found from the construction of the current set-up will delay commercializing the TAP for the moment. Next months focus will be on exploring and testing alternatives for converting acoustic power into electricity which can be scaled up in power as well. Within the framework of the THATEA project (European joint project FP7-FET) the multi-stage travelling wave engine designed and build by Aster is successfully integrated with the thermoacoustic part of the refrigerator designed and build by the French project partners Hekyom and CNRS. The integrated system is similar to the low temperature 4-stage engine reported in an earlier post (07-11-2010) in which one of the engine stages is replaced now by the refrigerator cell. 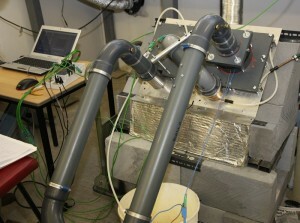 The result is a 3-stage thermoacoustic engine driving a single stage thermoacoustic refrigerator. Mutual distance between all stages equals ¼ λ yielding inherent acoustic matching. When the 3-stage engine is powered by thermal oil at an input temperature of 211°C the cold hex temperature of the refrigerator reach -40.5°C. Cold hex cooling power is 95W. At this temperature ice is formed rapidly on the non-isolated parts. Efficiency of the thermoacoustic engine and cooler, relative to the Carnotfactors is respectively 34% and 29%. These values are measured using helium at a mean pressure of 2.7 MPa and at a drive ratio of 1.53%. In the current set-up the drive ratio or pressure amplitude is currently limited by the maximum temperature of the heat source and by the more than 40°C temperature drop across the low cost heat exchangers used in the engine stages. Reducing temperature drop is a key issue in low temperature driven thermoacoustic systems. 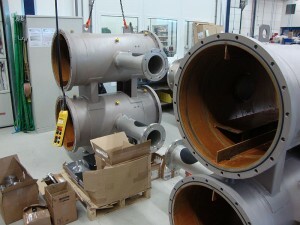 New heat exchangers with a more close fin spacing will halve the temperature drop and improve the efficiency up to 40%. Improvement of the current refrigerator stage is expected from adapting the regenerator material. Aster has the intention, and has already made a start to further develop this configuration towards a solar powered cooler as add-on for vacuum tube based solar heating systems. The output temperature of this collector type is up to 160 °C which is sufficient for powering a multi-stage thermoacoustic engine. Since the first experiments in 2004 current prices of vacuum tube collectors are reduced now by nearly one order of magnitude. Based on this developments and recent improvements in thermoacoustic the estimated return of investment now will be into the range of 5 to 8 years. For this project Aster is working together with a Polish investment company and a manufacturer of vacuum tube collectors. First prototype and demonstration is planned for summer 2012. By the end of September the installation of the TAP was completed. The flue gas heat exchanger is inserted into the STEG exhaust ( cross-section 3 x 3 m) and connected by an isolated water/steam circuit down to the intermediate heat exchanger located near the TAP. From the intermediate heat exchanger a thermal oil circuit is used to transfer heat to the high temperature heat exchangers in the engines stages of the TAP. The use of an intermediate hex for separation of both the thermal oil and water circuits was required here for concession reasons. In future systems this intermediate heat exchanger and pump has to be avoided because of the additional temperature drop which is harmful at low operating temperatures. The low temperature heat exchangers in the TAP are connected to an existing cold water storage tank in a stand about 80 meters away. All fluid circuits are equipped with pumps, flow sensors and thermocouples for measuring thermal powers. Piezo resistive pressure sensors on the TAP are used for measuring mean pressure, pressure amplitude frequency, phase and acoustic power. 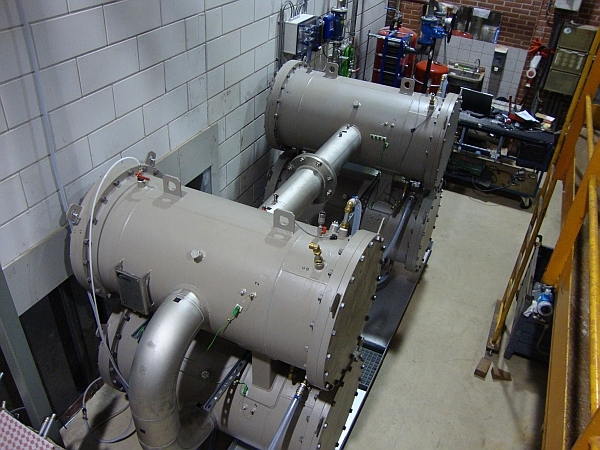 Testing the periphery was done by running the TAP, without alternators and with pressurized air (up to 750 kPa) to generate maximum heat flow trough all heat exchangers. At maximum heat flow the temperatures at the various sections are measured. Conclusion from this test was that the effective temperature for the TAP to run at is limited mainly, but not only, by the heat transfer in the thermal oil circuit. Also the air sided temperature drop in the flue gas heat exchanger is higher than expected. As a result the effective input temperature of the TAP is not more than 100°C which means that about 60 °C is lost in the periphery. This observation stresses again the conclusion that at low and medium temperatures the design and performance of external circuits, to supply and reject heat to the TAP, are as important as the performance of the TAP itself. On July 11, the thermoacoustic power (TAP) unit was transported from the assembly hall of Huisman in Elst to the final pilot location at Smurfit-Kappa Solid Boards in Nieuweschans. During this transport the TAP was split in two halves to be able to pass the door and to manoeuvre the whole in position. Heat has to be supplied to the TAP. 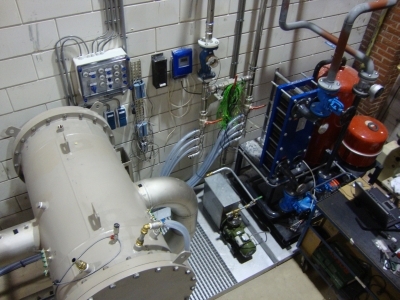 Therefore a dedicated +100 kW flue gas heat exchanger was installed at the turbine-steam boiler exhaust at the roof of the building and completed with a hot water circuit from flue gas hex to the intermediate hex near the TAP. For heat removal a cooling water circuit was prepared and installed. During next weeks these high and low temperature circuits will be connected to the heat exchangers of the TAP. For testing and validating the TAP is also provided with pressure and temperature sensors for measuring thermal and acoustic power levels and a real time data-acquisition and monitoring system. This picture shows the final set-up at the pilot location. 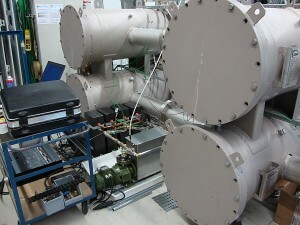 In the back the connections to the high an low temperature and the intermediate heat exchanger are visible. 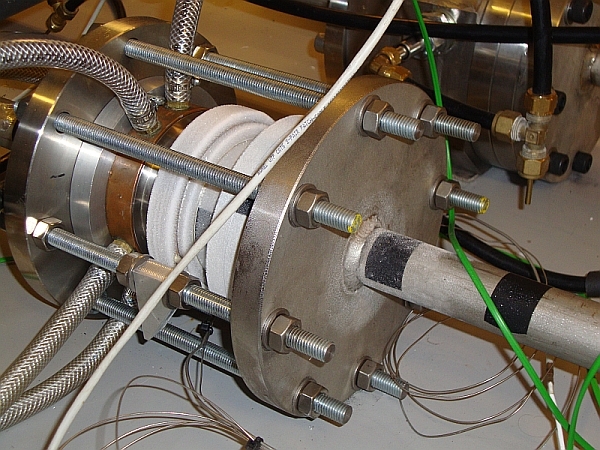 The four balanced alternator sets for converting acoustic power into electricity are still under construction and will be installed inside the pressure vessels afterwards when thermoacoustic characterization is done. After a lot of preparative work by the consortium, finally the construction of the thermoacoustic part of the TAP was completed by last week. The high- and low temperature heat exchangers and regenerators are assembled to single units, provided with thermocouples, mounted in the pressure vessel and connected to the high and low temperature fluid circuits. Also the data-acquisition system was installed for real time measuring temperatures and acoustic power. The complete test setup of the TAP is depicted below. 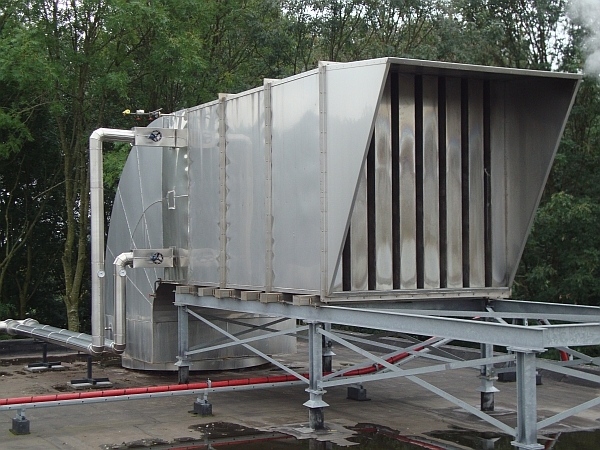 At the construction location no 100 kW (waste) heat is available therefore a controllable heat source (9 kW electric oil heater) is used simulating the flue gas heat exchanger. This temporarily heat source allows for measuring static heat loss, onset temperature and the increase of acoustic loop power with temperature difference in the low power range. Based on well known scaling rules the power levels in the TAP will be one order of magnitude less but the system will be thermoacoustically similar to the final system (using helium at 600 kPa) when filled with air at 240 kPa. This “similitude” allows for judging the performance of the TAP and for validating the simulations. 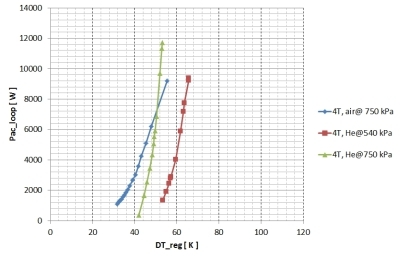 As a first result, the onset temperature difference of the TAP was measured to be 29 K between the high temperature (49°C) thermal oil and the low temperature (20°C) water circuit which agrees well with the simulated values. This is an encouraging result because a low onset temperature is a key parameter and absolute requisite for successful operation of waste heat recovery systems. So the first test is passed and more test will follow. Last week, with the delivery of the pressure vessels and feedback loops at the assembling hall, the construction of the 100 kW TAP (Thermo Acoustic power) unit is started. The housing is build in two sections and will be filled with helium at 600 kPa. Because of the large volume the design, construction and testing of the pressure vessels takes a lot of effort and is done according to the PED 97/23/EC category IV requirements. 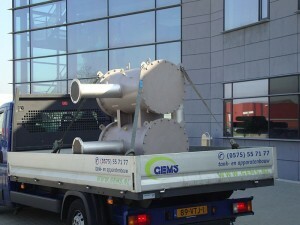 During the last months most parts and components like heat exchangers, regenerator, valves, pumps etc. are prepared, manufactured or ordered and are ready for assembling now. After the build is completed the TAP will be tested functionally at low mean pressure and low power first before transporting the system to the paper factory plant in the north of the Netherlands. There the TAP will be coupled to the flue gas heat exchanger which will be installed during the next production stop. According to the plan we expect to have TAP in full operation for testing by the end of May. 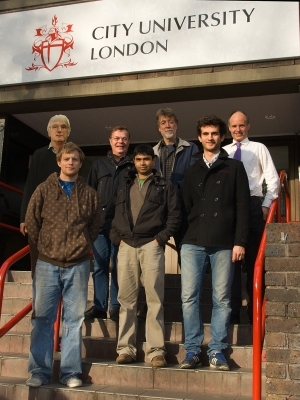 On November 23th 2010, the Score team and Aster successfully tested a wood fired thermoacoustic engine with integral alternator at City University London. 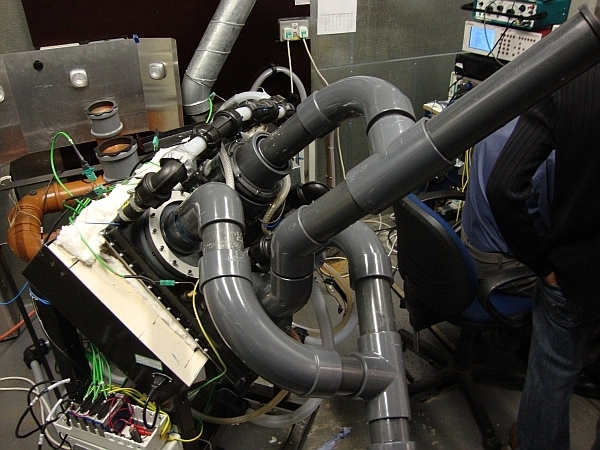 Aster in collaboration with Nottingham University developed and built a planar traveling wave 2-stage thermoacoustic engine. City University London designed and built the prototype wood stove, the two were successfully integrated and power was generated on the first run. Score also includes the University of Manchester, Queen Mary University of London and the charity Practical Action. Feedback by near traveling waves in order to end up with the smallest possible feedback loop. When pressurized to 0.5 barg (150 kPa) the highest electric output measured at 350 °C regenerator temperature difference was 23 W using a standard loudspeaker as linear alternator. 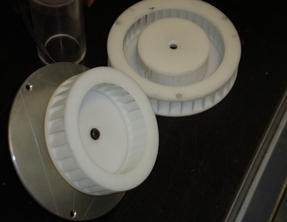 The measured acoustic to electric conversion efficiency of this speaker however is only 35%. 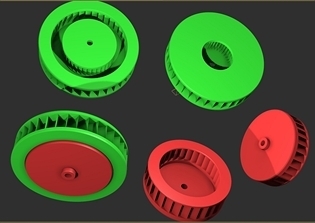 A better alternator of 60% efficiency is under construction by the Nottingham University. When available, this alternator in the same configuration raise electric output to nearly 40 W. Steady state running achieved 7.5 Watts to charge a 12v Battery with atmospheric pressure acoustics.